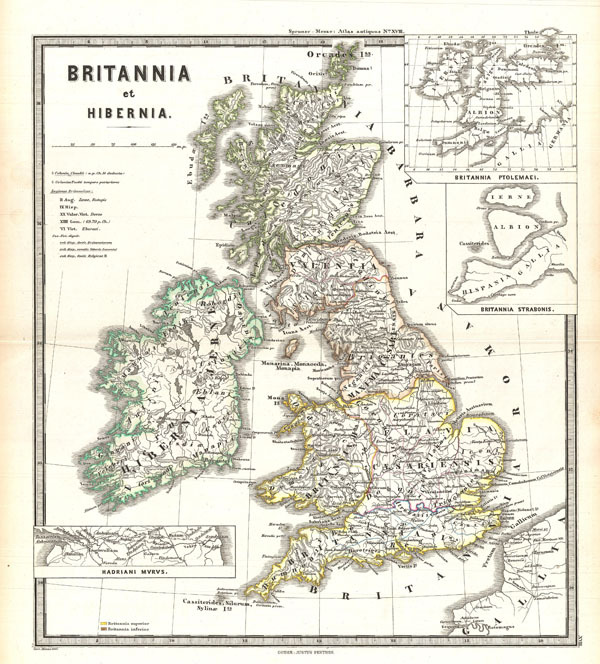 This is Karl von Spruner's 1865 map of England, Scotland, and Ireland (Britannia et Hibernia) in antiquity. Shows names of ancient tribes and peoples and the areas they inhabited. In addition to the main map there are three insets detailing Hadrian's Wall, Britannia according to the Alexandrian cartographer Ptolemy, and Britannia according to Strabo. Map includes a scale and a legend in the upper-left quadrant. Map notes important cities, rivers, mountain ranges and other minor topographical detail. Territories and countries outlined in color. The whole is rendered in finely engraved detail exhibiting throughout the fine craftsmanship of the Perthes firm. Rumsey 1626.018. Phillips (atlases) 3288. Espenhorst, J., Petermann's Planet, p. 397-404. Espenhorst, J., Andree, Stieler, Meyer & Co., p. 148.